If you want Egyptians to respect you, you better respect yourselves and treat us fairly. You can criticize us, disagree with us but with honesty and fairness, not by false accusations and fierce attacks, and ruining the reputation of our country in front of your public opinion and misleading your readers and spreading lies and fabricated narrative stories. Your job is to publish facts and not to incite for violence or biased to terrorism against 87 million Egyptian who struggle to get their country on the right track. Your job is to work with us for a common goal and help us to achieve it by publishing truth and facts as they are happening on the real ground, and not to translate them in your pure imagination to serve a certain agenda. Yes Dear International News Agencies Imbeciles, you lost our respect. This article is dedicated to my dear imbeciles of foreign news agencies, international human rights organizations and foreign governments. I always treat people the way I want to be treated, with respect. And as long as you contempt my people’s free will and challenge their free choices, you don’t deserve any respect. You are smearing every step we take, any decision we make. You smeared and ridiculed Egyptians voting on the constitution referendum. You accused us of ignorance and retardation of voting on something we have no idea what it is! 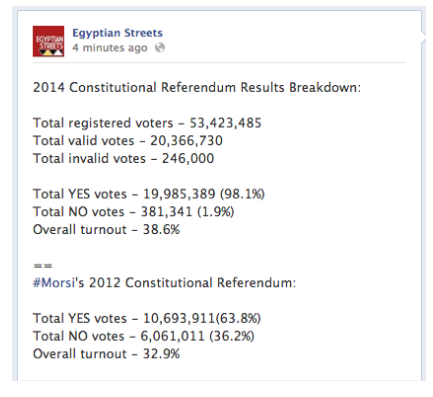 You claimed that Egyptians were forced to go and vote yes on the constitution. You claimed that we gave away our freedom because we did not accept to be directed by you! You did not condemned Muslim Brotherhood practices and human rights violations when we were screaming for human rights support. You did not publish the truth when Muslim Brothers were controlling all the country’s joints and dragging us to the dark ages in all aspects. You don’t take any initiative to listen and publish opinion of more than 80% of the Egyptian population and what they really want. You claim that Egyptians are giving away their freedom and decent living and social justice for security by a police and military state. Despite our weak economy, Egyptians did not revolt against their regime for food under any circumstances, it was mainly a revolt against changing the identity and entity of a 7000 years old great civilization. It was a dignity and freedom revolt. What do you know about Egyptians?! Nothing. You guys are in total denial status! We don’t have any expectations from you guys, because even when you were supposed to write about the constitution, you had to mix the voting issue with the same broken record expressions, Egypt’s military Coup, Egypt is oppressing freedom of speech, military ruling and Egypt is back to dictatorship, Egypt is smashing the opposition and peaceful protests! Meantime, You are deploying all your efforts in smearing and attacking one Egyptian man! This fierce attack on our Minister of defense is telling us one thing, you guys are panicking that Sisi becomes the next president of Egypt. You are not attacking him personally, but you are attacking his popularity. Because he dared to take his own people’s side and protected them from a civil war. Because he dared to stand against a fascist regime that you guys are supporting. Because he directed Egypt to independence away from the US peanuts Aid. Because he reacted positively to meet with Egyptians demands and did not stay neutral watching us getting slaughtered by your favorite Muslim Brothers terrorists. Because he did his duty and the Armed forces duty in protecting Egypt’s national security and unity. 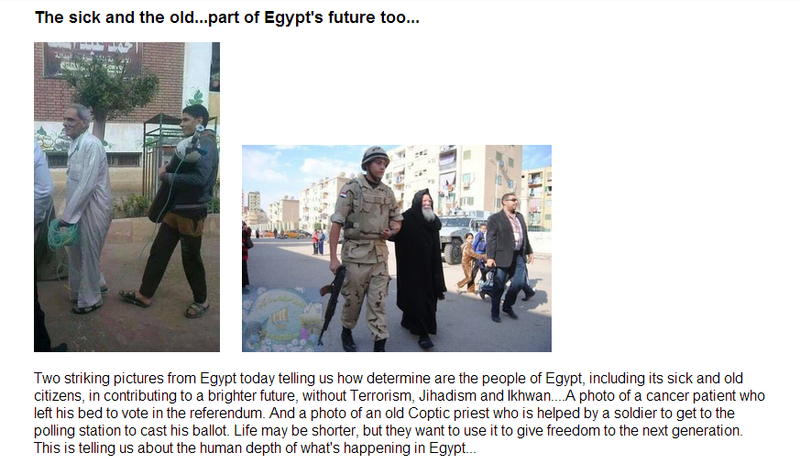 Egyptians will choose whatever path they want for their own country and not your agenda’s path. Egyptians became independent when they realized that the people of Egypt are the only power and source of all authorities. Game over! HUFFINGTON POST published on 16/1/2014 “U.S. Must Suspend Funding to Egypt’s Military Regime”, written by Kerry Kennedy / President, Robert F. Kennedy Center for Justice and Human Rights. Ms Kerry, Egypt did not ask for funding or aid from the United States of America, you really should address your anger and attacks on the US instead of launching your missiles against Egypt. I also don’t think the United States of America is a rotten kid in your own Kinder garden that needs some lecturing and instructions from a human rights tutor like yourself. Your saying that it is prohibited funding to countries where democratically elected governments are toppled by a military coup. What is the definition of democracy Ms Kerry? If democracy has the same definition of fascism, then you are talking about a totally different regime, did not exist in Egypt! You also have chosen wrongly the word “elected” because obviously you are not aware of the fact that presidential elections were forged. I consider you using this military coup expression, as an insult to all Egyptians who participated in the 30th of June revolution, because this statement of yours is forging facts and history. The military’s duty Ms human rights tutor, is to protect the country and the people and that’s what the Egyptian Armed Forces did, they did their duty and met their own people’s demand. I agree with you Ms kerry, that the U.S. government must stand on the side of human rights, the rule of law, and democratic progress; Except that you addressed this statement of yours in the wrong place and time. You should have mentioned this brilliant statement of yours to the US when Your Muslim Brothers and Sisters were in power in Egypt, because Obama’s administration was rewarding, supporting and financing a terrorist Organization who violated human rights, acted above the law and ruled the country with fascism and dictatorship. Read history and learn Ms Kerry, because it is a disgrace to be either ignorant or a blatant liar! The Editorial of the Guardian published on 16/1/2014 The Arab spring: made in Tunisia, broken in Egypt – Where did Tunisia go right, and Egypt so wrong? Tunis is not enjoying peace nor democracy, you blatant liars, read Tunis news and do your homework with some honesty! The regime in Tunis is no difference than the former terrorist regime in Egypt. Except that they have put into consideration that what happened to their Brothers in Egypt is likely to happen in Tunis, so they just backed off a little bit, fearing to face the same destiny if they follow the same agenda of their idiots brothers in Egypt. It is as simple as this! The military in Egypt delivered the authority after the 2012 forged elections to Muslim Brothers and did not interfere in politics my dear Guardian editorial board, the military in Egypt protected the country and the people from a civil war, If the military stayed neutral and ignored more than 33 million Egyptian demands, Egypt was going to have the same Syrian scenario. It is also as simple as this! I guess you guys wanted a civil war to take place in Egypt, so you can have something to munch-on instead of having this daily burden of inventing fabricated news! Your claiming that Egypt is back to despotism the minute Sisi will become the president, this is not an accusation to Egypt nor an insult to Egyptians or to Sisi, this is actually a direct insult and accusation to the United States of America who supported Mubarak’s regime for more than 30 years! Do you remember Editorial imbeciles of the Guardian that Mubarak was a civil president with a military background?! The law doesn’t forbid a civil man with military background to run for presidency. Is the US a leader in the world or a follower? Since when the US is forced by any country to take certain action that they reject! Since the guardian said so, I guess! Ask the previous American administration and the current one, why did they support Mubarak for 30 years! Were they magnetized by the curse of pharaohs?! MIAMI HERALD Posted on Friday, 17/1/2014 France: Egypt should look to Tunisia’s example. Yes right. Just like when you guys said that Egypt should follow the real path of Yemen’s democracy! Indeed Yemen is going on your right path of division. This is the real democratic path when an Arab country gets divided to provinces that’s the right path! Let them divide their own countries and kill each others. Egypt doesn’t follow any country’s path, specially the countries which entered into internal conflicts and division. Who told you that Tunis is a freedom and democracy heaven?! Read the latest on Tunis news, There is a conflict in Tunis with constant economic, social, security crisis. It is a matter of fateful crisis. The regime in Tunis is scared to face the same destiny of their brothers in Egypt, so they are using pain killers against the opposition and protests! Political activists and opposition leaders got killed in Tunis, same scenario in Egypt, coalition of the regime with terrorists! And soon it will blow in their faces, just watch Tunis closely, instead of fabricating stories about the real situation there. Egyptians are not giving their freedom away and Egyptians were not Voting Away Their Freedoms, like Time Magazine published By Jared Malsin on 14/1/2014, that Egyptians are giving away their freedom. Egyptians are choosing what they want and not what a bunch of politicized journalists want. Egyptians challenging terror attacks and participating in the voting and standing in long Queues and expressing their happiness that their country’s is back to them. Disabled old man went to vote despite his disability and was crying after voting, asking God to protect the country and move forward. Egyptians vote on the constitution, while standing in long queues and condemning Muslim Brotherhood terror attempts to ruin the voting process. Muslim Brotherhood tried to spoil the voting in two committees in Munufiya city and Shebin Elkom, they threatened people and tried to terrorize them and direct them to vote no on the constitution, but they got arrested by the security forces. Egyptians said, this constitution is making all Egyptians equals in front of the law, this is a feast for all Egyptians. We want Sisi to go for presidential elections and we will challenge the world who is interfering in our internal affairs.